Some more playing with the throttle linkage tonight. Last time I was thinking that replacing the rod end bearing on the forward end of the linkage with a clevis might solve my alignment issues without needing any bulkhead passthrough hole tweaking. Well, I got to thinking about that even more and decided that what would really be nice would be being able to use a clevis on both ends. It’d be way easier to hook up than the rod ends, and in fact the clevises were my original plan when I first played with this stuff. So tonight I wanted to do some trial fitting with the clevises to see if it looked like my idea would work out. But first there was the issue of needing some threaded rod to connect the clevises to the linkage (both have female threads). Well, I stopped by the hardware store, and they didn’t have any 10-32 threaded rod. So instead I just bought some 10-32 stainless bolts and cut the heads off them. These might or might not end up being the final pieces here, but they at least let me get things mocked up. One problem with this is that the clevises are significantly longer than the rod ends, so even with them threaded down as far as they’d go, the linkage is way too long. But it was just short enough that I could get it lined up with the forward throttle full forward and the rear one full aft. All I really cared about was seeing how the linkage lined up with the holes horizontally. And it turned out pretty nicely – on the forward end, the linkage sits almost dead center in the center section bulkhead holes. This makes me happy because I’d rather not remove any more material there. The other passthrough point is on one of the bulkheads on the rear side skin – here, as I kind of expected, the linkage rubs the inboard side of the hole, so it’ll need to be widened a bit. But there’s plenty of room to widen it. Another option might be to simply move the rear throttle outboard a bit – I think I can do this fairly easily, the only question is whether the hole cut in the rear armrest will still work or not. I’ll have to poke at that another night. To finish out tonight I trimmed some material off the linkage tube and then got the cut end tapped for the threaded rod. That’s as far as I got tonight though, next time will be even more test fitting. In other news, I’ve been continuing to work on systems stuff on my morning and evening bus rides. 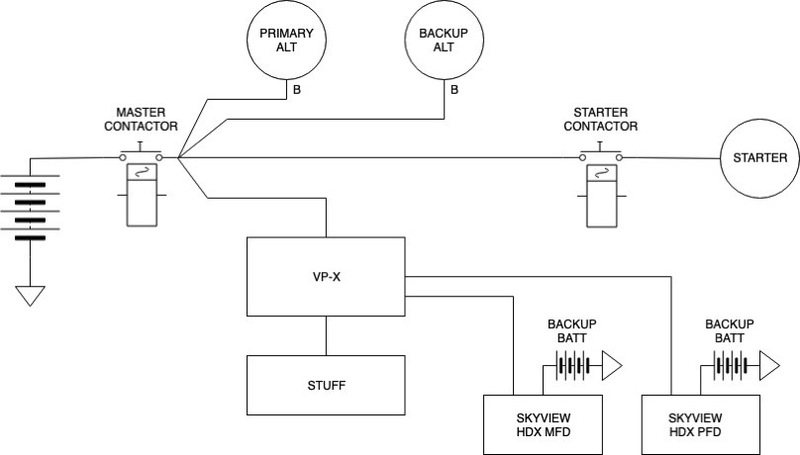 Right now I’m trying to really nail down the general architecture, which has meant lots and lots of reading, including the VP-X install manual, Dynon Skyview literature, and so on. So far I’ve got a rough idea of the electrical backbone in place, the main thing I’m trying to think through is failure scenarios. There’s a whole wide range of stuff that’s covered by “redundancy,” so I have to parse a lot before I can make a decision about what’s right for me. But I have been having fun drawing rudimentary schematics in draw.io. Well, my intent for tonight was to put in some more time on the throttle quadrant situation, but that didn’t really happen. After the last work session, I went back and read through the whole odyssey from the first time I did the throttle quad stuff. One thing I’d forgotten was that normally, the linkage between the front and rear throttles uses clevises at either end, but I’d gone with rod-end bearings in order to move the linkage outboard a bit and get some breathing room on the holes. This is a useful thought because where the new front throttle lever sits is really close to being in alignment with the linkage going through all three holes. So my thinking after doing all that reading was that maybe I could use a clevis up front and minimize the tweaking of the passthrough holes. First thing tonight was to figure out where I’d put the clevises (which I confirmed that I had ordered by checking my Aircraft Spruce order history). Then it was on to taking a second look at the setup. I did confirm that the linkage is pretty well-aligned with the lever, but that’s as far as I got. I’m not even logging any hours for this, since all this took me about ten minutes in the shop. The night wasn’t a total waste, though…I came back inside and spent some more time mucking around with panel design. I like this overall layout with the EFIS screens and other stuff in the main panel. Right now I’m playing with switches on the far left (lighting switched will be on the right console, not shown here), not sure I want to put too many there. This isn’t even representative of all the switches I’ll actually have – for that I need to think some more about what my electrical system is going to look like. I’m kind of thinking of grouping the switches a little more intelligently, maybe putting some up at the top of the main panel, such as things I won’t be using regularly in flight (engine start stuff, emergency bus, etc). The idea for the Infinity stick grip diagram on the right side I shamelessly stole from another builder on VAF. I think it’s a great idea and a great way to clearly document what all the stuff on the stick will do. Well, tonight is a shining example of what I’m going to call “cascading dependencies.” My initial plan tonight was to start by just finishing the few remaining steps in the current construction manual section, then go back to the incomplete pages from earlier and see where I needed to pick up there. Literally the two remaining steps in this section were to rivet some nutplates to the quadrant cover and then install the quadrant in place. But here’s where it gets fun. 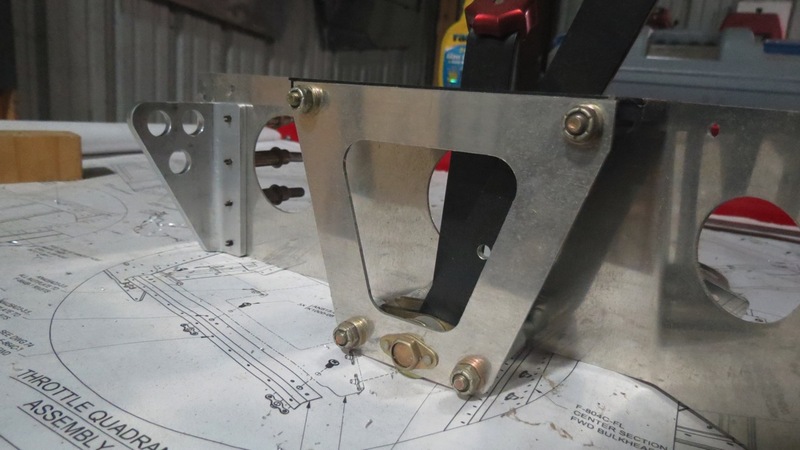 Way back when I was working on the quadrant, I’d decided to go with a fixed-pitch prop, and all my work had revolved around that, from working out the linkage to the rear throttle to fabricating a custom throttle cover plate. Since then, I’ve decided I want a constant speed prop after all, so I knew at some point I’d have to revisit all those things, and tonight was that night. So I swapped the throttle quadrants out on their mount, then looked at modifying my custom cover plate. Except I discovered a crack in that plate emanating from a screw hole. Sort of randomly I decided to go dig up the factory cover plate (whose opening is too large for the smaller two-lever quadrant), and whaddya know, the opening is the perfect size for the three-lever quadrant. Nice easy solution to that issue. The next fun was/will be reworking the linkage to the rear throttle. Since the three-lever quadrant is obviously wider, it places the forward throttle lever bit further outboard (I haven’t measured it exactly, but I think it’s something like 1/8”). That, in turn, means that the holes I carefully cut through the center section bulkheads and other parts need to be expanded outboard. I got as far as temporarily mounting both throttle quadrants and routing the linkage, just to begin evaluating where and how I’ll need to trim. The good news is that I don’t think I’ll need to remove that much material, and also there’s plenty of room to expand the passthrough holes as well. The bad news is that it’s going to be harder to work with these holes than last time – when I did this before, the side skins weren’t on and I had great access. Now I’ll have to be leaning into the fuselage the whole time, though that’s made easier by the fuselage rotisserie setup. But I’m definitely remembering how much time I spent on trial-and-error the first time around with this. The work isn’t that bad, but having to repeatedly install and remove the quadrants and linked is a bit of a pain. So next time I’ll pick up with this bit of fun. I should be able to get this done in one solid work session, and then I can finally rivet those nutplates and get a little closer to hanging the empennage. Oh, and that raises another point – this is probably a good time for me to decide whether or not I’m going to preemptively do the SB 14-01-31 reinforcement work. Technically the service bulletin doesn’t require the reinforcement be done until/unless cracks are observed in the spar, and I have to say the work doesn’t look like a lot of fun to do. On the other hand, it’s not going to be any more fun ten years into the airplane’s lifetime either. And to be honest, at this point if I massively ruin something, I’d probably just build a new horizontal stab. It wouldn’t be the end of the world. Basically it’s just a matter of deciding whether I want to bet that I’ll never actually develop the cracking. It’s been a while since I read up on the SB info, but I seem to recall it was more common on some of the older RV-7 kits that didn’t have precut relief notched in this area. I dunno, I’ve just gotta go do some reading again. So I spent most of the day working outside, yard work and so forth. But after it got dark and I had some dinner, it was time to get out and do some plane work. I started off working on the console, as mentioned last time. It turned out there wasn’t a ton to be done with this thing. Really, there are just two screw holes at the aft end that need matching holes drilled in the center bulkhead cap it mates to. So it was just a matter of attaching the console with a few screws, drilling those two holes in assembly, and then removing the bulkhead cap and installing nutplates in those two holes. Then there was a lot of bandsawing, filing, shaping and smoothing on the bench grinder, and so forth. Oh, and I also had to drill the three 1/2” holes for the anchors themselves. Again, not too bad, just being careful about the locations and stuff. The only fun part is that I don’t have a good quality 1/2” drill bit, just the one in my cheap generic drill bit set. So I ended up drilling the holes with the largest nice bit I had (7/16”) and then opening them to final size with my unibit. And since the angle is thicker than each band on the unibit, I had to do this from both sides. And then I got to working smoothing the inside of those holes, which were just a bit too small for my dremel sanding drums to go into. That just left a bit more to be done. 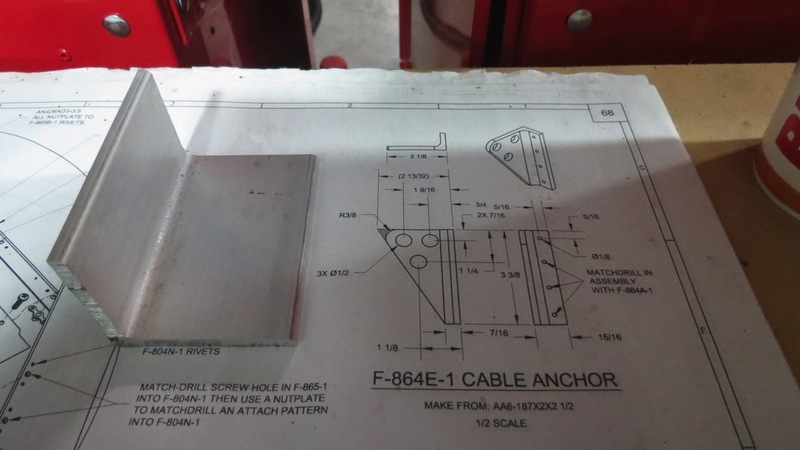 Interestingly, these holes won’t be used to rivet the anchor to the the mount; it attaches with screws. 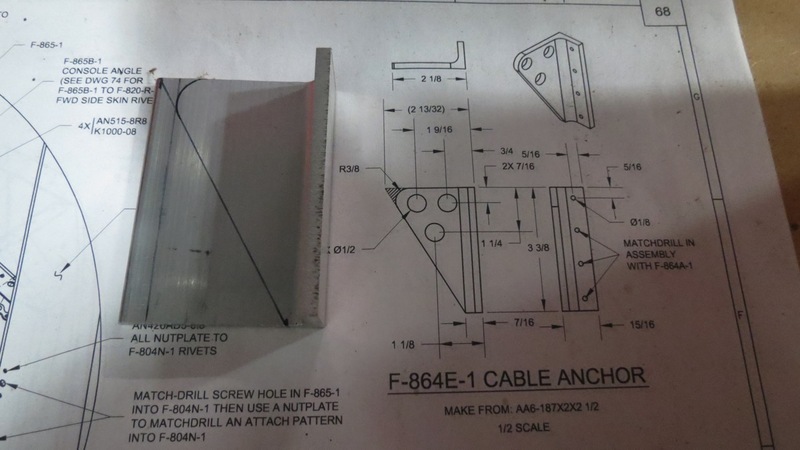 But it doesn’t use nutplates either; instead, the holes in the anchor get tapped for 8-32 screws, and then the matching holes in the mount are opened to #19 for the screws. And then it was time to go inside, feed the dogs, and relax for a while. I still need to do some deburring and cleanup work on the throttle quadrant mount, but before I do that I have to remove the actual quadrant, which is there from when I did the rear throttle sometime far in the past. So tonight was mostly spent getting those nutplates riveted to the seat ramp components. Took a bit of creativity to get some of the rivets done in some tight corners. These parts should be pretty well done now, though I’ll want to shoot some primer and paint on them, hopefully I can get that done this weekend. Next up will be the right-side console; I went ahead and pulled the plastic off that piece tonight and deburred all the edges. Not a ton of stuff tonight. I started working on prepping the front seat ramp parts. Nothing unusual here – final-drilling some nutplate rivet holes, trimming some extra material, and deburring all the holes and edges. Deburring here was more fun since there were lots of little nooks and crannies. Long straight edges are a cinch on the bench grinder, these little guys require some creative work with assorted needle files. …yup, found them. So I’m set for some nutplate riveting next time. Then I think these parts just need primer and/or paint if needed. I’ll have to decide what really does need paint – I think only the ribs for the ramp will be visible, with the rest covered by the seat cushion, so there shouldn’t be much to do here. No photos this time. Feel free to use your imagination to envision me hunched over small parts, squinting and wielding a needle file. Yep, time today for more fun with lights. 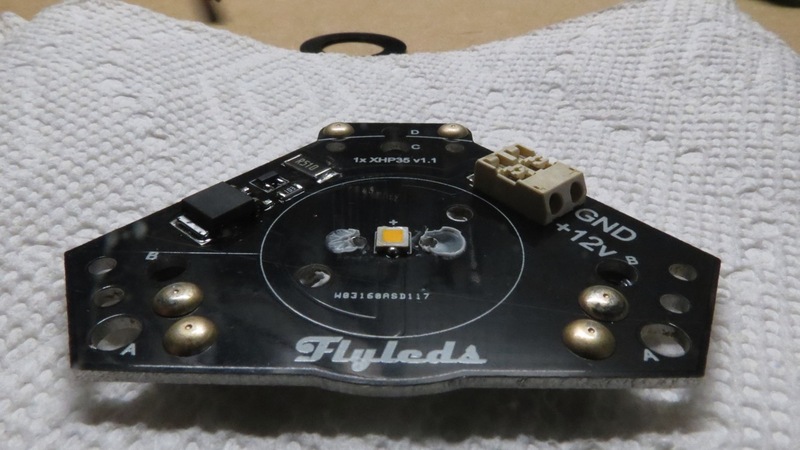 I really liked the wingtip boards I got from Paul at Flyleds, and when he mentioned offering a combination landing/taxi light unit for RV leading edge cutouts, I was pretty excited. I ordered a pair of Whelen lights, well, several years ago, intending to use them here, but Paul’s stuff looks far superior. I even got to handle an example last summer, since he made it to Oshkosh. 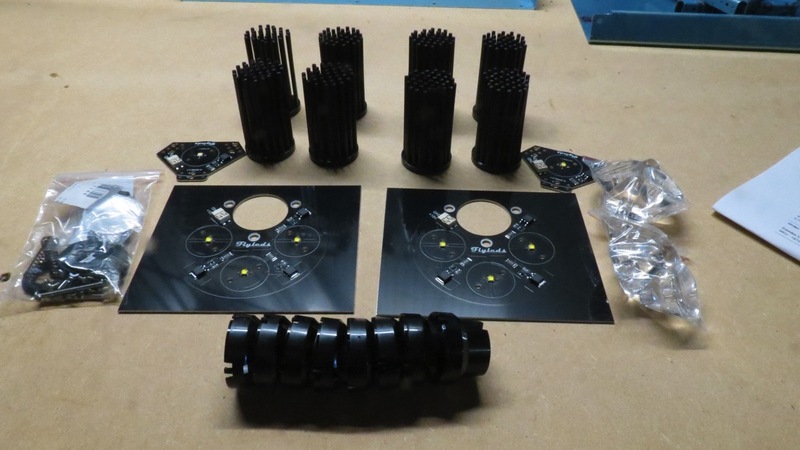 Assembly mostly consisted of installing the lenses and heatsinks for each light. Additionally, the small aimable boards needed three nutplates riveted onto each one for eh mounting/aiming screws. This was actually a bit of a challenge, since some of the nutplates are the single-lug type. The rivets on these are really close together, which makes things fun. I’ve only ever riveted these with flush rivets, where at least you can position the squeezer to make some more room – but this kit includes round head rivets, and in that case there’ no choice but to center the rivet in the set. So I actually ended up shooting a bunch of these with the rivet gun. Then it was on to the lenses. Here, a mounting cup snaps into place on the board, the heatsink is coated with some sort of thermal glue, and screws go through the cup and into the heat sink, securing everything together. Then the lens simply snaps into the cup. The instructions warn that this must be done very carefully; the base of the lens actually fits over the LED, so carelessness here can easily damage the LED. Which is exactly what I did on the second lens I installed – despite being super careful as I pressed it down to lock in place, one side locked and the other didn’t, which took off some of the LED. Interestingly enough, the LED still lit when I put power to it. Maybe it’s salvageable, I’m not sure – I emailed Paul to find out. Hopefully I don’t need to order replacement parts, but we’ll see. The rest of the lenses went on with no trouble, and then I installed the one aimable board to one of the large boards, and of course there had to be some testing. 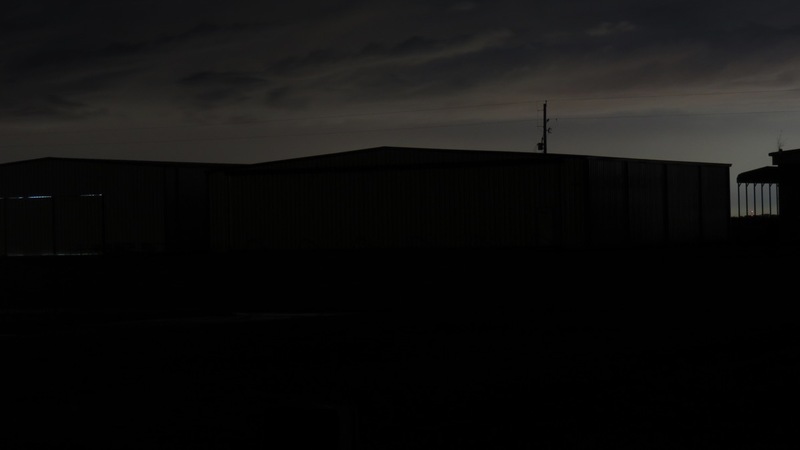 After basic function testing, and after it got dark, I went outside to do some real-world testing. 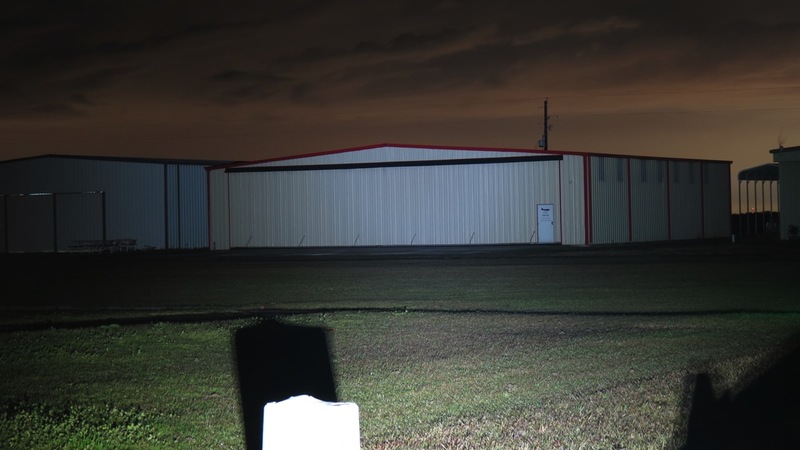 In the following photos I’m aiming the light at a neighbor’s hangar, a little over 300’ away across the runway. I’m only powering the three landing light units on the large board, not the one taxi light unit on the small aimable board. Both photos were taken with identical camera settings (something like 15s exposure at f4.0). So basically on the plane I’ll have two lights like this, which I think will provide, um, adequate lighting. 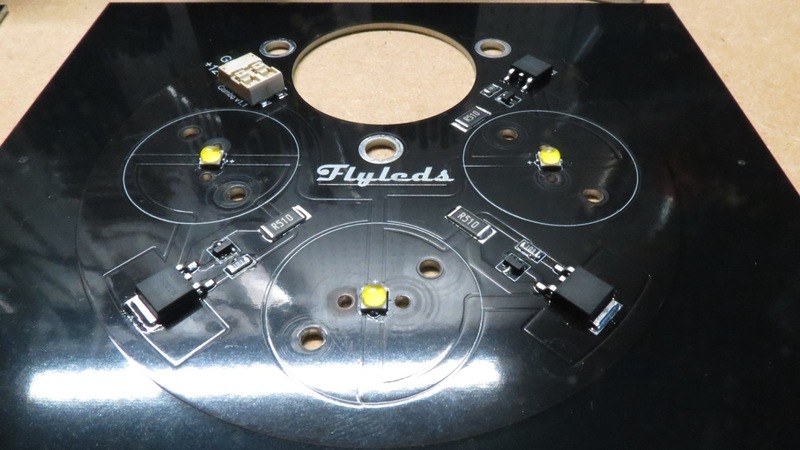 The one thing I forgot to do was to take a photo of the finished product, but it looks like this (photo from the Flyleds site). Once again it’s been a while since I’ve been here, and yeah, it’s been a while since any real work got done on this project. I will defense myself slightly by saying that I have been doing some stuff, just not real luggable work. Josie and I made it to Oshkosh this year, where I did a lot of prodding various vendors and firming up plans for systems. And over the past few months, I’ve been spending some of my morning bus rides reading up on systems stuff (I read Bob Nuckolls’ book cover-to-cover) and beginning to architect my electrical system. On that latter point, I have a sizable spreadsheet going which covers all the components I expect to install, their pinouts, and how everything ties together. But still…there hasn’t been anything that actually happened out in the shop. Today, though, I finally got to cleaning up some messes I’d left from other projects, and suddenly I got the itch to do something. So I decided it was time to finish up these light boards. Way back when I worked on these last, I found I was short a couple of green LEDs. A quick email to Paul settled that issue, and after the long wait for mail from Australia, I had my two LEDs. So to get back in the groove of things tonight, first I had to solder those last two LEDs into place. Then I just had to solder the power resistors and connectors to the right-side boards, and things were done. Nothing to it really. But then I wanted to go a step further and test out the entire setup. I had, in fact, acquired a breadboard a while back for situations like this one. 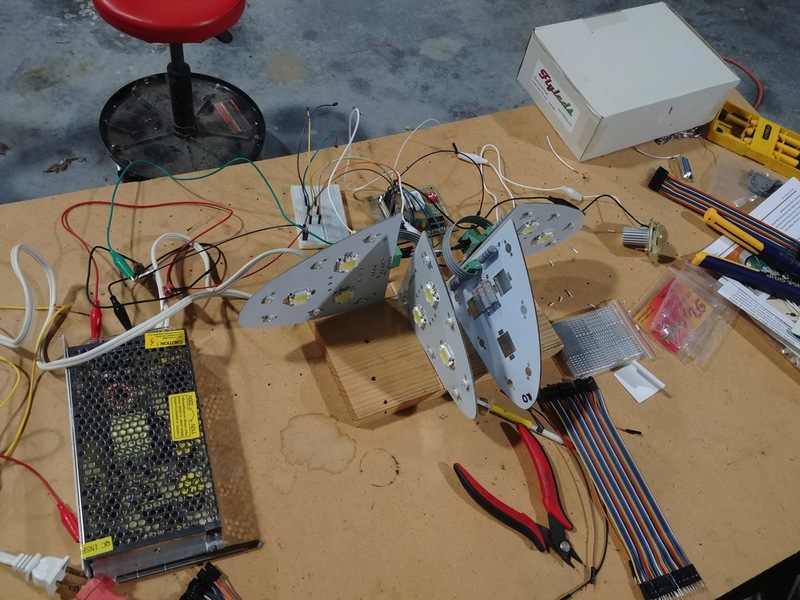 So I set about tying the light boards together (each wingtip has its two boards connected via a ribbon cable) and then hooking everything up to the control board. Then I got the control board tied to the breadboard, where I could attach jumpers to simulate switched inputs on the panel. That let me turn the position, strobe, and wig-wag functions on and off easily. Oh, and I also cut some slots into some scrap wood to actually hold the boards. So first off, the good news: The board that didn’t want to work right last night is now fixed. As planned, I took the board to work and tried testing it with the multimeter in the lab, but that didn’t yield any more new information. Slightly defeated, I spent the rest of the day with the thing sitting on my desk, but an eagle-eyed coworker dropped in, asked about the boards, and after looking for a bit pointed out that one of the LEDs looked to be slightly out of place, in such a way as to maybe cause a short circuit. 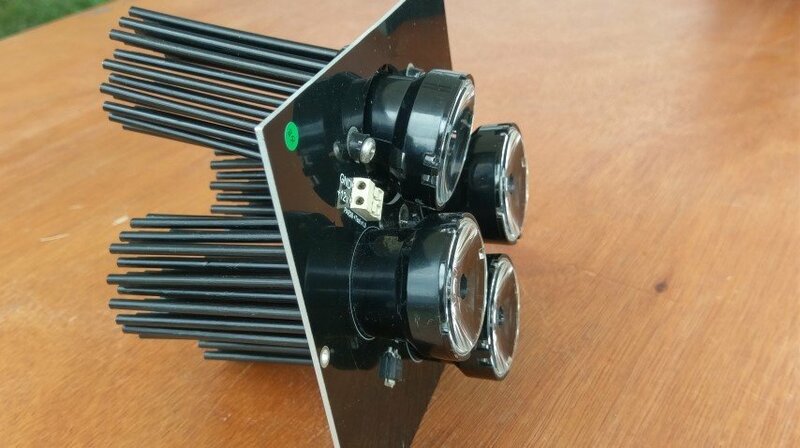 That idea fit with the evidence I’d seen – no lights, resistors getting super hot under power, and I’d already observed oddly low resistance across that particular LED. So when I got home tonight, I repositioned that LED a bit. Put power to the board and…well, one string of red LEDs lit up, but not the other. Slight progress at least. Some more testing with the multimeter and I identified another LED that seemed to be shorted. It didn’t look like it visually, but I decided to reposition it anyway. And lo and behold, after that they all lit up! Even better, it actually worked when tested. Test #1 is to just power up the board and observe the little LEDs on it. The red/green ones represent the wingtip strobes and the yellow one the tail strobe. By observing these you’re seeing when the board would be switching on/off the respective lights. This is a good time to tinker with the various settings (flash rate, number of flashes, flash pattern, wigwag pattern). The other fun test is to put the multimeter in continuity mode and probe the power pins for the wingtip strobes. 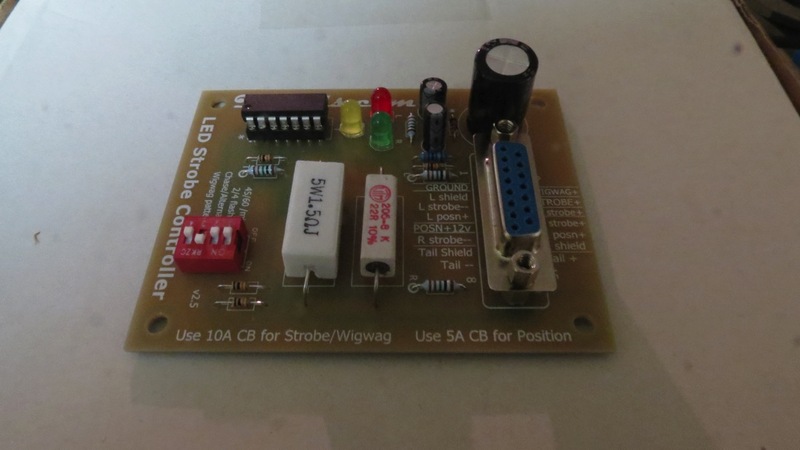 In this way you can hear the multimeter beep in time with the relevant LED flashing on the board. Somewhat underwhelming in a certain sense, but still cool to see/hear it work. It’ll be really fun when I can put all this stuff together into a test rig of some kind (and probably test it out on the ramp at night).